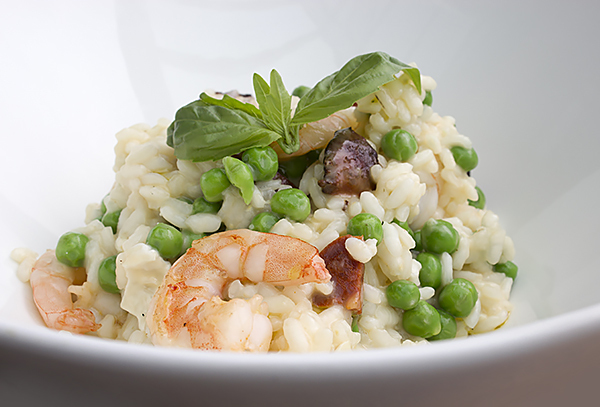 With its prawn and chorizo combination and lemony flavour to give the dish a citrus spark, this summery risotto recipe is a little bit like a cheat’s paella (and it’s very easy to make in our steam combi microwave)! Put the onion, garlic, butter and mushrooms in a large Pyrex® casserole dish. Place on the base of the oven and cook on STEAM 1 + LOW MICROWAVE for 10 minutes. Add rice, juice and rind of the lemon, stock and wine to the mushroom mixture. Cook on STEAM 1 + LOW MICROWAVE for 10 minutes. Stir risotto. Add peas and cook on STEAM 1 + LOW MICROWAVE for 8 minutes. Add the prawns and cook on STEAM 1 + LOW MICROWAVE for 4 minutes. Leave to stand for 2-3 minutes and garnish with a sprig of parsley to serve. Made using the NN-DS596B steam combination oven.